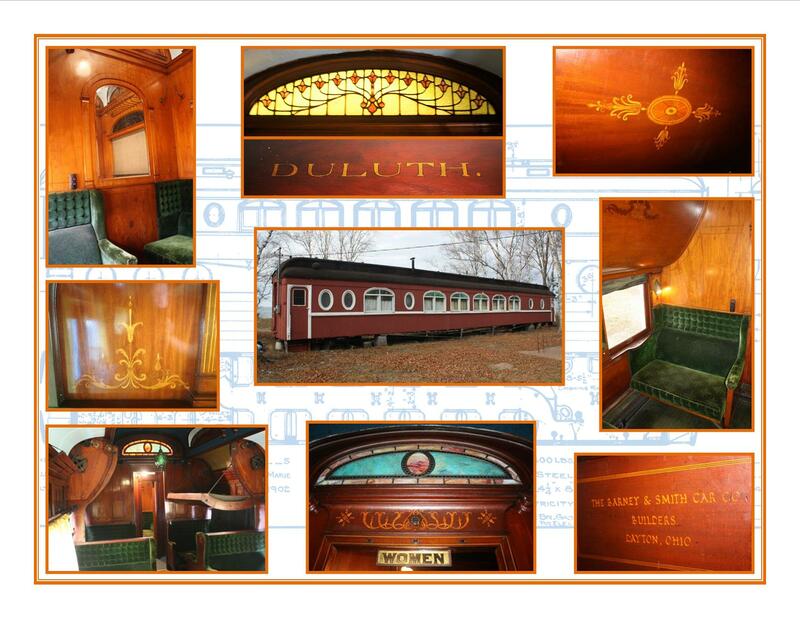 Duluth South Shore & Atlantic sleeping car “DULUTH” is one of a series of five 10-section sleeping cars built by The Barney & Smith Car Company of Dayton, Ohio in 1902. 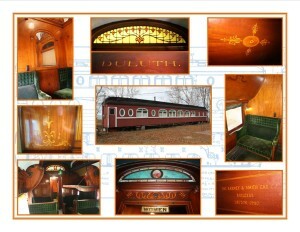 The car is of all wood construction, with varnished mahogany interior, fine marquetry throughout, stained glass windows and green plush upholstery. In addition to the sleeping section the car features a stateroom, a smoking room as well as men and women lavatories. The car was used on the DSS&A’s North Country Mail (between Duluth, MN and Sault Ste. Marie) and remained in active service until 1934. The car left the DSS&A in December 1934 when it was sold to a Michigan resident and hauled to the shores of Lake Superior where it has been used as a summer cottage for the past 80 years. The current owners recognizing the significance and the fine condition of the car approached Mid-Continent about donating the DULUTH to the museum. The MCRM Restoration Department inspected the car and determined it to be an outstanding addition to Mid-Continent’s Collection of wooden cars. The MCRHS Collection Committee recommended to accept the donation of the DULUTH and the Board of Directors accepted the recommendation at the December 12, 2015 meeting. The immediate goal is to raise $35,000 for moving this remarkable car to North Freedom in the summer of 2016. Once at North Freedom, the car will be placed on trucks and initial restoration efforts will be focused on acquiring the appropriate 6-wheel trucks for the car, installing draft gear and steps on the car. A comprehensive restoration plan will be developed and fundraising will continue with restoration work proceeding in a staged manner. Ultimately, the restored car will provide Mid-Continent with a very unique and rare passenger car that can be used on special occasions, placed on display or included in Mid-Continent’s Wooden Car Tours events. Help Mid-Continent bring this rare and unique car to Mid-Continent by making a donation. We need your help to raise the $35,000 by May 15, 2016. Please consider making a donation to the DSS&A sleeper DULUTH Fund and help bring the DULUTH sleeping car to its new home. Thanks to the support of donors like you, we have successfully raised the funds necessary to bring the DULUTH to Mid-Continent Railway Museum. Preparations are presently underway to move the DULUTH to its new home. Despite the car’s overall excellent condition, some restoration work will still be necessary. For this reason, donations toward the DSS&A sleeper DULUTH Fund continue to be accepted. Make your donation via mail using our printable donation form or donate online using the form on our Donation page. Be sure to write in “DSS&A sleeper DULUTH Fund” on both the printed and online forms. Credit/debit card donations can be accepted by phone at 608-522-4261 or 800-930-1385 during museum office hours. All donations are tax-deductible.